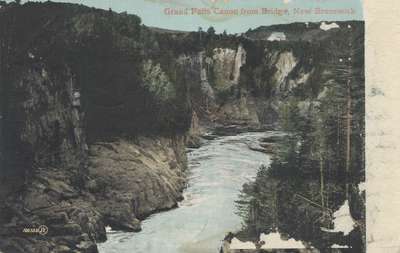 A postcard sent to Rev. R.B. Layton, Oakfield, Halifax Co., Nova Scotia, from 24-year-old Agnes Mary Kitchen in Grand Falls, New Brunswick. Grand Falls is the largest waterfall east of Niagara Falls, dropping from a height of 23 meters (75 feet). Thought you would perhaps be interested to know that I got to Grand Falls. Have met Mr. & Mrs. Des B. also Mr. H.C.F. Walked about 7 miles yesterday over the line with W.K. and am so tired today that I can hardly move. Hazle told us all about the pleasant time you gave her and likes somebody very much.